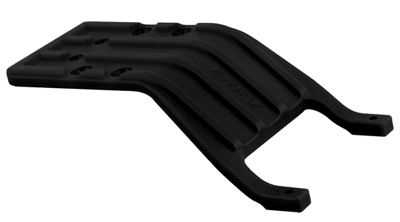 RPM Slash 2WD Rear Skid Plates, Black Discounts Apply ! RPM81242 - RPM Slash 2WD Rear Skid Plates, Black. RPM rear skid plates for the Traxxas Slash 2wd are designed to eliminate the frustration of broken skid plates and chassis. When a stock rear skid plate fails, it can rip the rear shock tower mounting screws out of the chassis, causing a catastrophic failure usually resulting in the rear end sailing in a different direction than the rest of the truck. With RPM skid plates mounted, that problem will be a thing of the past! Tech Notes: Stock rear bumper mounts (Traxxas #3677) will not work with RPM skid plates. To retain the use of a rear bumper or wheelie bar, RPM #80902 or #80905 must be used. RPM skid plates are designed for and only guaranteed to fit a stock Traxxas Slash chassis and chassis components.